As I read these verse today I laughed a little bit. I thought about my youngest son and how much he reminds me of myself. He's 26 now but the one incident I remember was when he was just a little guy. It was a Sunday morning, I was getting ready to preach and he was with me in the kitchen. He wanted a waffle so I did what most other men would do. I got the frozen Eggo waffles out to toast him his breakfast! I was all dressed and ready to go and he was watching me bounce around the kitchen getting his food ready. As I reached into the pantry for the syrup it slipped out of my hand and fell to the floor. The impact caused the cap to pop open and a single stream of syrup rifled out that drew a line straight down my body from the top of my shirt to the waist of my pants. Ordinarily I would probably have gotten angry, yelled a bit because my clothes were ruined and stormed out of the kitchen. But God had been working in me concerning my reactions and especially anger. As the syrup drew a stripe down my body, I shockingly looked at Justin and he looked at me...there was a pause and I laughed out loud. Instantly Justin laughed too and it was etched in our memory forever! From that day it seemed like everything I did, he imitated. My son imitates me. Your children will do things you do. So you and I need to do good things! 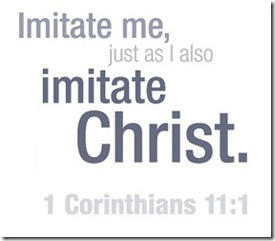 Paul encouraged us to imitate God. In everything you do. That's setting the bar high I know but that means when others imitate you they too will be imitating God. What would God do? Live a life filled with love. Laugh at yourself rather than explode in anger. Be kind instead of starting to unwind. The world is full of stinky situations and lots of stinkin' thinkin'. It's time we became a pleasing aroma. Imitate God!